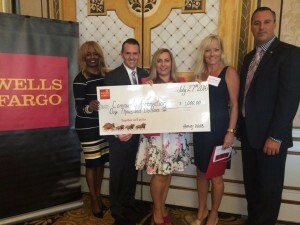 The Lenape High School PTO was awarded a $1,000 grant on July 27 by Wells Fargo to support the organization’s mission of Project Graduation. Project Graduation is an event held for seniors on the night of graduation that is planned and organized by parent volunteers. The event is an opportunity for students to gather one last time to celebrate their achievement in a safe environment while enjoying food, music, entertainment and door prizes. “At a time when donations from the public and private sectors are down due to the economy, we truly appreciate the support Wells Fargo has provided,” said Linda Schwartz, Lenape PTO President. “We will use this grant to help offset the cost of next year’s event to be held on June 14, 2017. Wells Fargo’s 42 branches in the Southern New Jersey — South Jersey region distributed a total of $41,000 in grants to support nonprofit groups — $1,000 for a nonprofit identified by each store manager. “Our local branches see which nonprofits are out in the community making a difference every day,” said James Newson, Wells Fargo’s South Jersey area president. “We use this as an opportunity to celebrate and say thank you to Lenape High PTO for all of the value they have provided to our community over the past year. The Community Connections program offers Wells Fargo store managers the opportunity to provide additional grants to local nonprofits of their choice in New Jersey, Connecticut, Delaware, New York, and Pennsylvania. A total of $140,000 in Community Connections grants is slated to be distributed throughout the months of July and August in Southern New Jersey.